Bartolomeo Scappi (?1500-? ?1577) was perhaps the most famous chef of the 16th century. 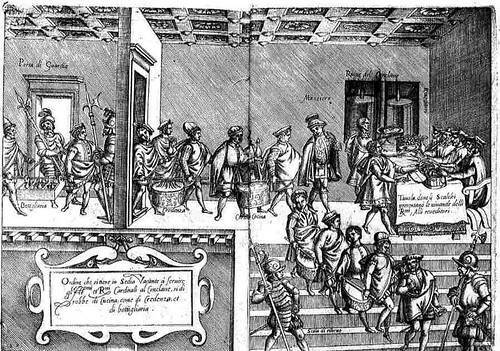 The banquets he prepared during appointments with Cardinals in the north of Italy brought Scappi to the attention of the Pope. He would cook for six Popes in total and was employed as private chef to two of them. 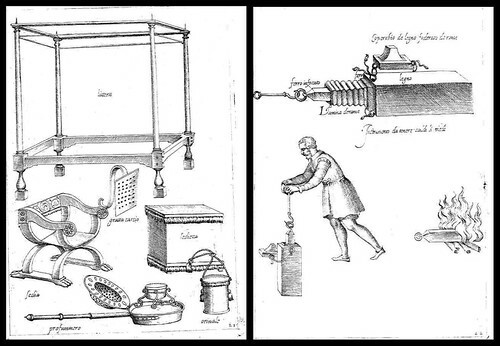 Lasting fame accompanied the publication in 1570 of the 6-book series known as 'Opera' [The Work(s)]. It was more a culinary treatise than a mere cookbook. Scappi included more than a thousand recipes, demonstrating his familiarity with dishes from a range of European and North African countries as well as his expertise with regional Italian cooking. 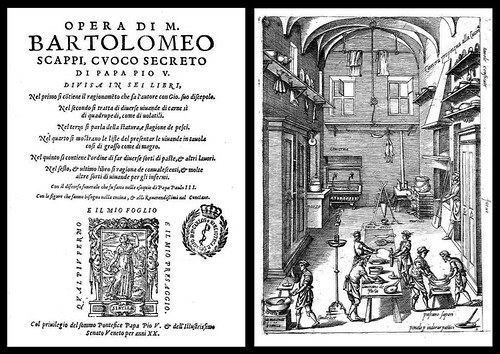 "The recipes of Bartolomeo Scappi blend the heritage of medieval gastronomy (spices and sweet-and-sour sauces) with some novelties unique to Italian Renaissance cooks : the important addition of offal in imitation of roman cookery, the introduction of dairy products (butter, milk), a significant increase in the number of meat or fish dishes employing the use of sugar, and the beginnings of flaky pastry." Book One: Begins with an imagined dialogue between a chef and his student about cooking, the duties of a head cook, kitchen implements and how to identify and preserve good quality food. 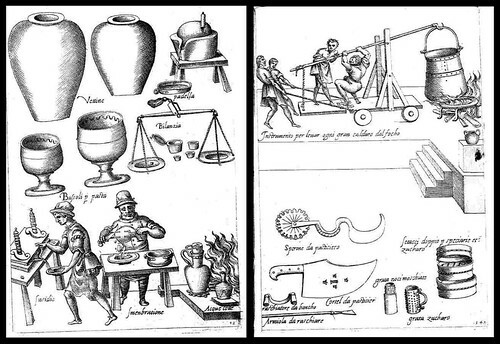 Book Two: Use of quadruped meat and domestic and wild birds and preparation of sauces. Book Three: Vegetables, fish and eggs. 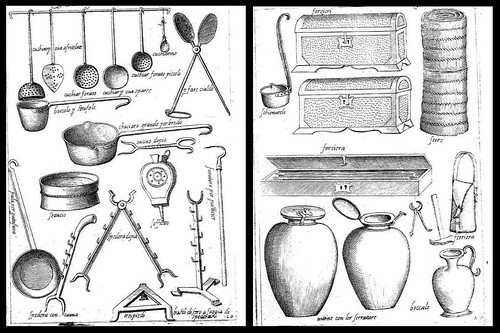 Book Four: Seasonal foods and the items required for travelling with a nobleman. Book Five: Pastries, cakes, and savoury dishes. Book Six: Food for the sick/convalescents. Seven editions of 'Opera' were released in about the first fifty years following the original publication and plagiarised sections appeared in numerous other culinary books. 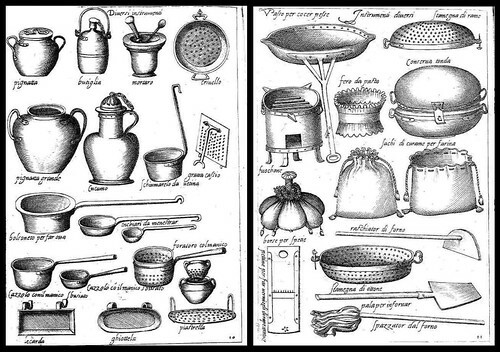 Scappi's magnum opus remains one of the great primary sources - in both written and visual terms - for factual details about the kitchens and cooking practices during the Renaissance. 1. Preheat the oven to 180C/375F/Gas 5. 2. Blanch the aubergine slices in a saucepan of boiling salted water for about five minutes, but don't let them get too soft. 3. Drain well, then dust with flour. 4. Spread a layer of aubergines over the base of a fairly shallow ovenproof dish. Top with some of the herb mixture, spice mixture, chopped garlic and a splash of oil. 5. Continue layering up the ingredients (you should make 2-3 layers), ending with a splash of white wine vinegar. 6. Transfer the dish to the oven and bake for 30-35 minutes. Serve immediately. The images above from 'Opera di Bartolomeo Scappi' (that's all of them) come from Biblioteca de la Universidad Complutense de Madrid. They are obviously scanned from microfilm and I have removed some of the background 'noise'. 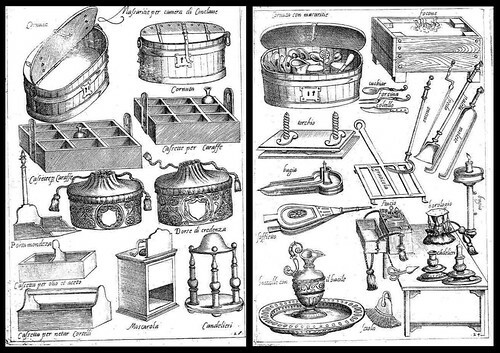 The first ever english translation of 'Opera' was published just last year - 'The Opera of Bartolomeo Scappi (1570): L'arte et prudenza d'un maestro Cuoco (The Art and Craft of a Master Cook)' - "Terence Scully presents the first English translation of the work. 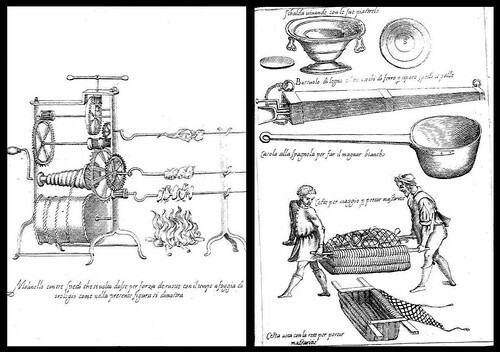 His aim is to make the recipes and the broad experience of this sophisticated papal cook accessible to a modern English audience interested in the culinary expertise and gastronomic refinement within the most civilized niche of Renaissance society." Opera by Bartolomeo Scappi at Old Cook. 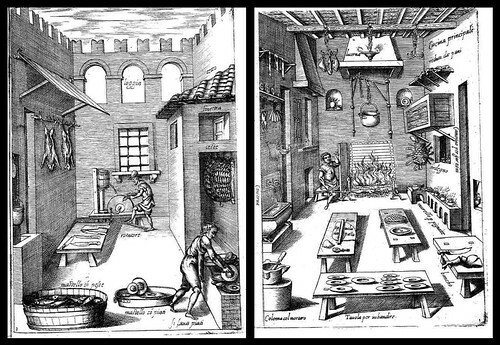 The story of the Pope's Cook at BBC gives some background from a documentary as well as some of Scappi's recipes (including the one above). Update: The First Celebrity Chef at Jost a Mon. 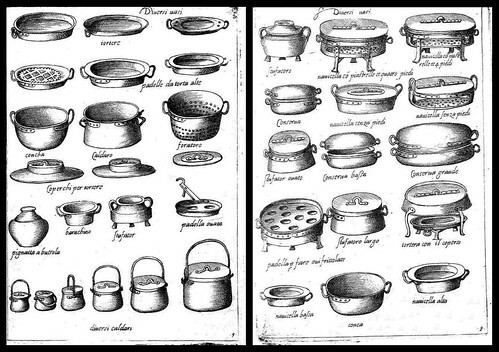 In general: Gode Cookery remains the most extensive portal with respect to Medieval and Renaissance era culinary history and they have some great clipart and jpeg image galleries too. Hi there. I've been following your superb blog for a while. Excellent stuff! Regarding Scappi, I've posted a piece, based on the BBC programme you allude to. I welcome your feedback. I can't help wondering whether high (or non-existent) ceilings were the norm in high-class kitchens or just looked good to the artist. And... just as I was wondering when we get to the food, a recipe! I suppose I ought to try it. Especially since fennel fronds aren't that hard to find these days. 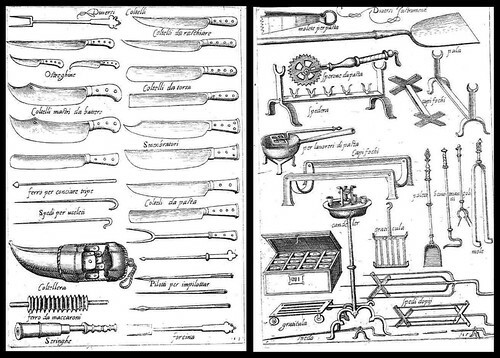 I love the layouts of utensils and tools. 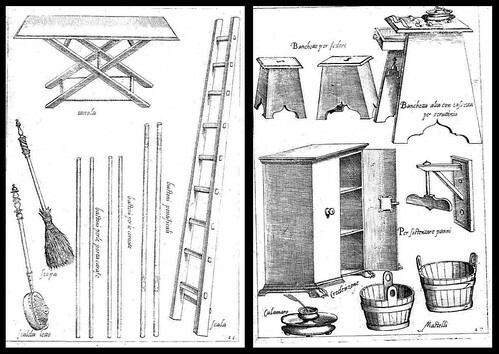 Some of those would make great kitchen posters. 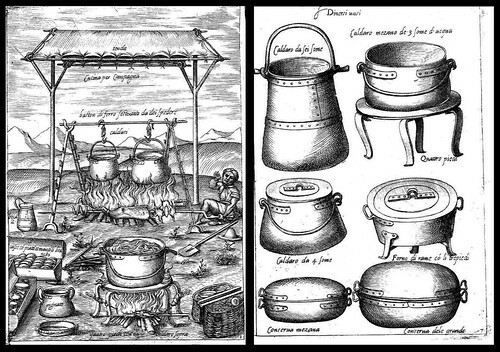 And ah, Gode Cookery -- I used to prepare menus for our school's medieval society feasts relying heavily on that site. Good stuff. Thank you, peacay, it's beautiful and I love it. Book six: food for the sick / convalescents; this is something we seem to have lost sight of today. Our modern reliance on medical science means we are in danger, at least to some extent, of forgetting the importance of understanding the role of food not only in maintaining health, but in combating sickness. What a divine post. If I could find a Pope I liked, I'd long to try my hand at papal cuisine. 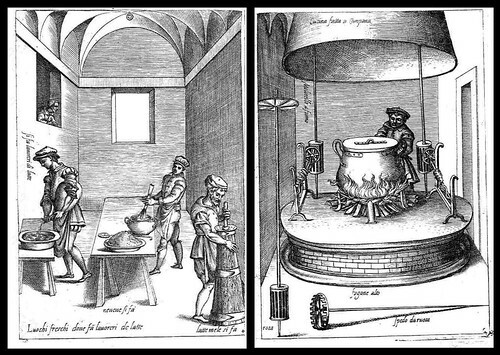 In the 1560's, however, I'd have been a-flicker with concern about feeding the Inquisition. Thank you!